Any color sweater would work with this outfit formula, but I like the all neutral vibe with the grey sweater. Plus the black jeans and white sneakers provide a stark contrast, so I like to wear some mid-tones on top to create a bridge between the light and dark. Any color combination of an elevated sweatshirt and jeans would work, but I thought this white & grey combo was fun and a little different. Of course, now it’s sold out in the black and most other colors/sizes too, but I thought it was perfect for this post, so I styled it even though I can’t link it. I did link to the other colors below as well as the sleeveless version, which is perfect for summer. I don’t know why I don’t wear more cardigans. I like this look, and I was so cozy with two layers on top! I rarely wear layers; they just feel constricting to me. Or at least they do until I get them on and settled in, and then I’m so cozy and warm, and I’m like, Why don’t I layer more often??? This cardigan also comes in a really pretty pink, a mustard yellow, and a classic black. Size down, though. I’m wearing a small and I wish I had the XS. You may think it looks the right size, but there’s a lot of extra material in the back. This is probably my least favorite of all the looks, but I went ahead and included it. Taupe and grey isn’t a combination I’d typically think of, but I’ve seen other bloggers combining these colors and wanted to try it. I like the color combo, but this sweater is too short with this jacket. The sweater I linked below would look better. My denim jacket got quite the workout when I was taking these pictures! I like how the denim jacket elevates the joggers in a way a sweatshirt or plain tee would not. Unfortunately these joggers are a size too small for me. They really should be a little more relaxed. That said, they are incredibly comfortable, so I keep them and only wear them with longer sweatshirts. 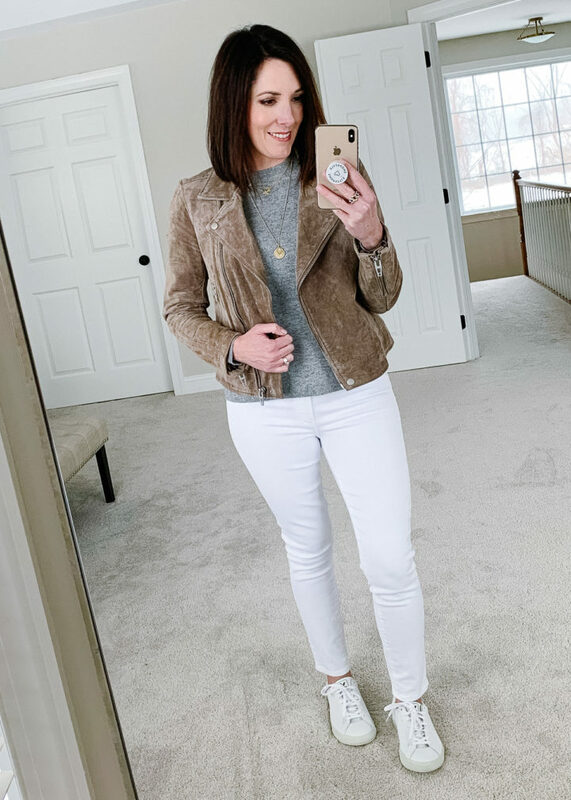 I love these olive sailor skinny pants from Loft, and they work really well with the white sneakers. A denim jacket would actually look great with this look as well! You could put a black sweater or an ivory one on top, or even coral or pink, but I like the way the grey blends in and keeps the look all neutral. In this case, I like the shorter sweater length with these pants because it allows the buttons to show, and it creates a pleasing 1/3 to 2/3 overall body proportion. FYI, these Vigoss skinnies are a great alternative to my pricey AGs. 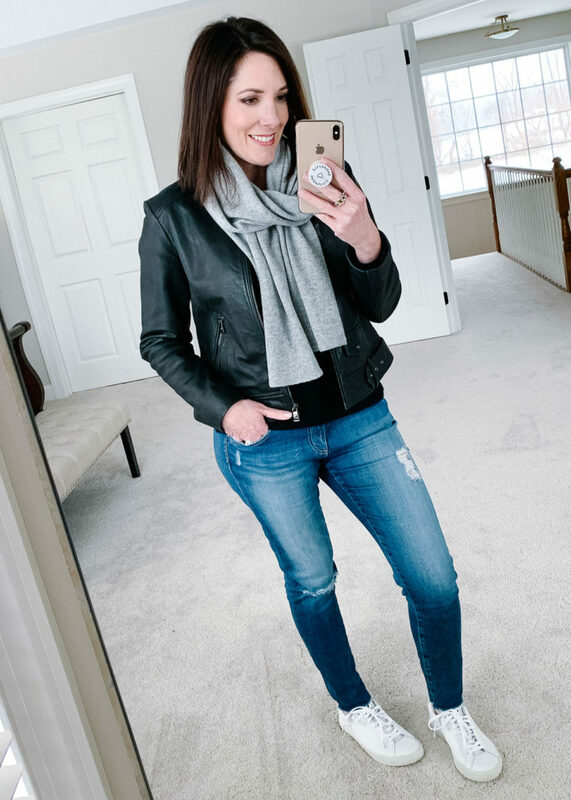 I love the mix of luxe cashmere scarf, edgy black leather jacket, rugged ripped jeans, and sporty sneakers. So much good visual tension going on here! I’m learning that having some juxtaposition in each look is key to making an interesting outfit. Would anyone be interested in a post on that topic??? In case you missed it, I reviewed 9 white sneakers in this post and since then I’ve tried even more. Below are my best recommendations. You can’t go wrong with any of these, it’s all about the look you’re going for and your budget. that’s one of my purchases for Spring, love the look of perfect white sneakers. The last look is hands down my favorite. I also really like the gray/taupe/white colors together, but I get what you mean about the sweater length. I think the solid neutrals have a classy look. I love your idea of a post with juxtaposition looks! Great post !! I am thinking of getting some white sneakers and love all the ideas you have shown. I really want to pull the trigger on the Golden Goose sneakers but then again it’s such a lot of money to spend on a sneaker (a handbag or a boot, I am all in). I like the Ugg option you linked so I will look into those. It is, but ask yourself if you will wear them as much as a boots or a handbag? I felt that I, personally, wouldn’t, but the quality is there. It’s really about budget constraints and cost per wear. Love the looks! thanks for easy things to copy! I love my white sneakers — Tory Burch — can you do a post on socks? Sounds dumb but I”m struggling with ones that don’t show, are comfortable and stay on! GM! Glad it’s warming up there and it will be 72 in South Texas. It’s nice but it’s also hard to know what to wear from day to day. One day it’s in the 40s and the next 70s. My favorite outfits are #5 and #8. 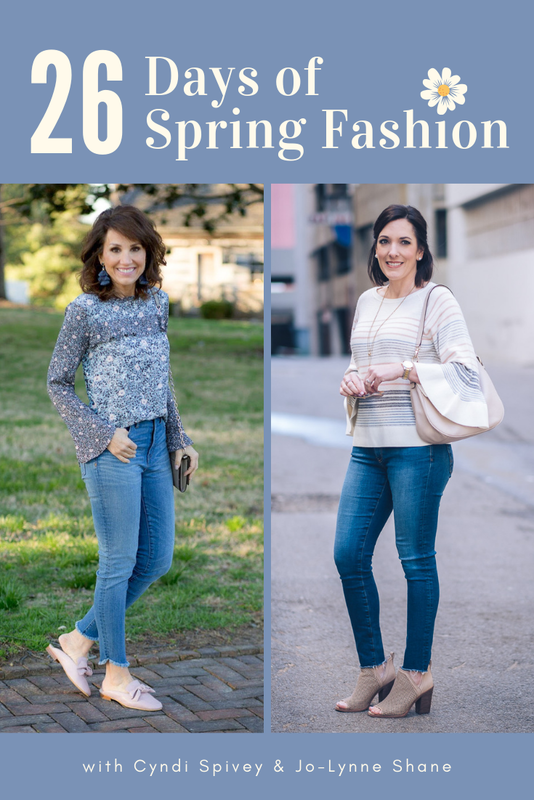 So many fun outfits in this post! I really loved the denim jacket with the black dress, and the joggers with the same jacket and shoes. I would be super interested in a post about juxtaposition. You do this so well and I could really use a tutorial. Thanks for the contrasting styles! Love the jeans and joggers looks with the sneakers. So glad that you are warming up to the 40s and 50s. It makes everything so much more tolerable. Just leaving the house is painful in our polar vortex. Congrats to all the Patriots fans (the words are choking me 🙂 Have to say it was the lowest scoring Superbowl in history and on the snoozey side at times. Awful half time show ever. Thanks for doing the Gal-entine’s looks. Looking forward to it! This is great; thanks for sharing. I have a pair of all white Adidas that I really like but each time I’ve worn them I’ve had comments like “wow, those are some white shoes”. I’m thinking “why yes they are, that was the intent” but I’m also thinking I may have styled them wrong. I sooooo appreciate these suggestions. Yes, yes, and yes! Thanks so much for this post! This is my absolute go-to everyday style. Love all the looks here and even wear some similar ones regularly. Now I have a few more ideas to add to the mix! Oh, and I ended up loving the UGGs and even the cheap GG dupes I mentioned ordering. You definitely don’t get the same quality, but you do get a similar look for way less. I’m not usually into major knock offs, but I knew the others just weren’t an option. I’ll be wearing them both a ton I’m sure! YAY! SO glad they worked for you. I have the Cole Haan GrandPro Stitchlite Tennis sneaker and also the leather version- most comfortable sneakers ever! Yes! A post on how to create some tension in an outfit would be helpful. I see all these outfits and wonder what makes a great outfit? What makes it stand out from all the others? Looking good Jo-Lynne! I can relate to being cold. Today it is -25C with the wind chill a balmy -35C. Let me tell you I am sooooo glad we have a heated garage at our house and that my work has underground parking, so I really don’t have to go out in this! YUCK! Warmer air is coming. It is GORGEOUS here today! I bought the Ugg sneakers and just love them! I have hammer toes and often cannot wear the shoes I love to look at. This time fashion and comfort came together for me, and I thank you for your review and suggestions. You rock! I’m so glad you found a pair that works for you! Yes please, to a post on adding interest to our outfits! I really enjoyed this post. Thanks, Jo-Lynne! Loving the white sneakers! I’d really be excited to hear more info on juxtaposition/visual tension. It seems like there’s a fine line between “that looks awesome” and “that doesn’t go together”. I tend to stay too much on the safe (boring) side! I really enjoyed this post! All great looks but I’m with you, #9 was my favorite! I never would have thought to pair a leather jacket with the white sneakers. I hadn’t thought about wanting to purchase white sneakers but now-maybe! I’d love a post on havong juxtaposition in outfits! Darn it! I think you are winning me over to the white leather sneaker side! When you started featuring these I was all “I love a fashion sneaker but light gray or beige is as close to white as I can go”. And now I’m thinking, “Hmm, maybe I would like a pair of Vejas”. Oh the power you hold! The only combo you showed that I didn’t love is the one with the taupe jacket. I do like the white jeans and gray sweater with the sneakers but something about the jacket doesn’t work for me. I think gray and taupe could work but those exact ones don’t seem to be quite right or something. And yes! I’d love a post about juxtaposing styles/fabrics/high-low to add interest to outfits. Great post! Having at least 3 different ways to wear one item before adding it to our closet is a great idea. I am enjoying wearing my white leather Keds. They fit my budget and have the necessary arch support, but they do have the silver eyelets. Oh well! I would like to see a post on juxtaposition because I definitely don’t know how to do that. Like you, we are enjoying warmer temps, but I hope it doesn’t last because we really haven’t had a winter down here. I hope you had a great day! I’ve changed gold buttons to silver using nail polish. Maybe you could use a while nail polish to cover up the silver grommets. Jo-Lynne – Love all these looks and especially the last one! I love to wear scarves and would like to see you address your thoughts on them sometime on FBL. I actually prefer them to turtlenecks as I can control the tightness,etc. Thank you for all you do! Have a blessed day! Me too Joanne. I hope they don’t go out. I see the infinity ones aren’t really around much anymore but they never were my favorite style ones anyways. Funny, I think of those pants as a cool olive… but I could be wrong. I’m not very good with the warm/cool thing, except for the obvious ones. Ha Ha You could be right. What do I know. LOL I guess I just don’t wear olive. Please talk about juxtaposition on LIVE. 🙂 I finally got a dusting of snow in NW Oregon this morning and I’m sad it already melted. UGH. I wanted a big snow. My daughter however in Seattle area got 6 inches. So funny how opposite the West and East Coasts seem to be. Have a good day. What about white sneakers with bootcut jeans? I can’t wear skinny jeans or straights. I love your sneaks! I have the Leith ruched, black dress like yours, except it’s black. I definitely plan to wear it with with leather sneakers…which will be my next project after I find white loafers…it’s a challenge to find shoes to fit my low volume feet. Thanks for all your fab posts, JoLynne! Great post, Jo-Lynne! BTW, I like the idea of seeing a post using juxtaposition in a look. Love the outfits! Do you like the Two by Vince denim jacket better than the Kut from the Kloth? I have those Zella joggers too and I love how soft they are but I had the same issue being in between sizes. Ultimately I decided on the smaller size since I really only wear them inside the house. I like them both equally, to be honest. I guess if I had to pick the Vince Camuto one is a little stretchy and more comfortable, but both really are. Thanks to all your talk on leather sneakers, I’m wearing mine more, which makes me happy! I particularly liked the black jeans and grey sweater look. Those black jeans are gorgeous on you, and I like the contrast of the black and white. The only look I didn’t love was the white jeans, which is perhaps because I missed the contrast. I think I prefer the white jeans with flats or booties, but maybe a colored sneaker? I generally prefer white sneakers, but I’ve seen some cute colored sneakers on my kids’ friends lately. Are you keeping those 3X1 jeans? They really do look good. Surely they’ll go on sale on of these days. I already returned them, but I was considering ordering again, lol! I really wish I could find them on sale.